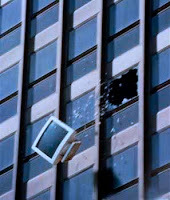 I bravely decided that its time to upgrade to the new Windows 8. 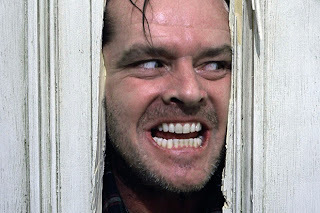 For me, To actually go ahead with the upgrade, one of two things need to happen, a total system crash that cant recover or a period of two weeks of taking inventory of everything on my desktop and making a total backup of everything. This time, I didn't wait for the crash. Having almost everything set, after downloading the ISO from Microsoft, I wanted to burn the image to a DVD only to realize that the DVD decided to die and I threw the spare out months ago. Since I'm not big on waiting to get a new one (I will Monday) I looked for a more immediate solution, Installing Windows 8 from a USB thumb drive. 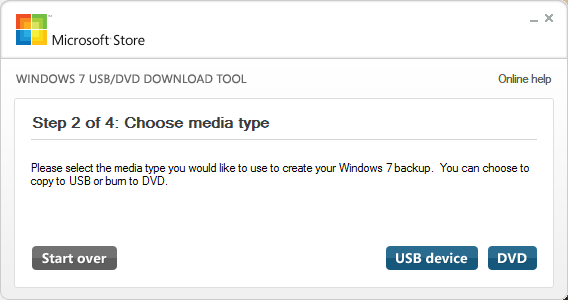 The windows 7 USB / DVD download tool will copy the ISO file to your USB drive and make the USB drive bootable. 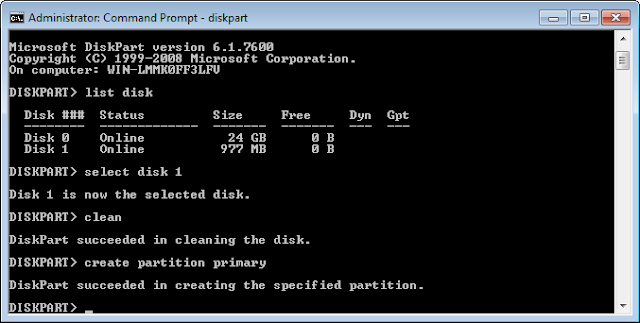 It seems to be the most common and easiest way to create the bootable USB drive for Windows 7 or 8 installation. 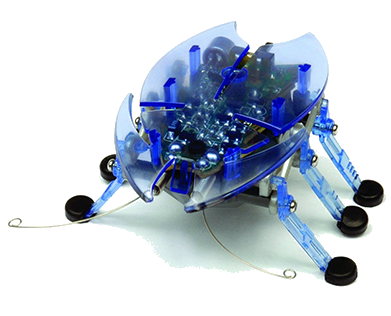 Install the tool, its a fairly simple next, install, finish procedure. 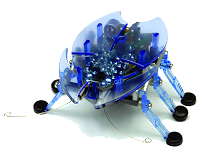 Once installed, run the program. An icon should be placed on your desktop. 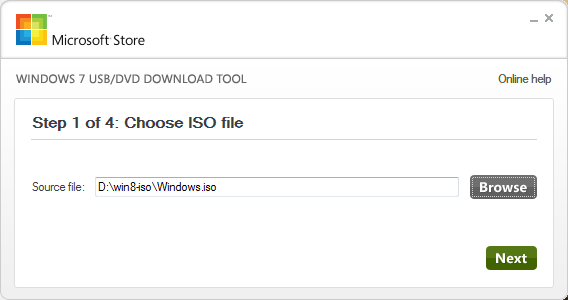 You will be asked to select the windows installation ISO file. 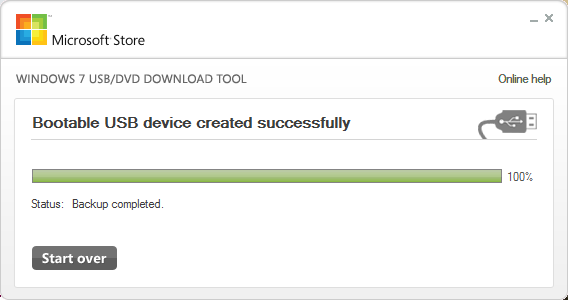 Next Choose the USB device option. 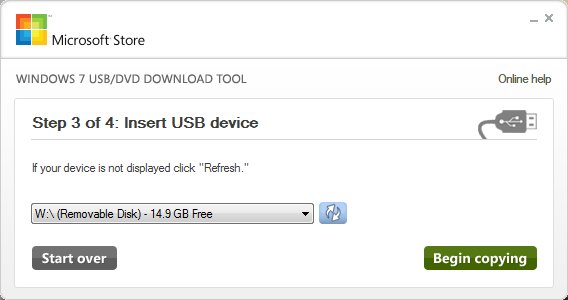 Select The correct USB device and click on Begin copying. 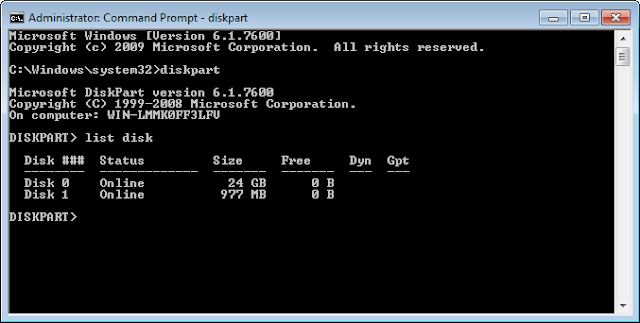 The Tool will format your USB drive and set it up as a bootable device. This was the simple Fool Proof way. 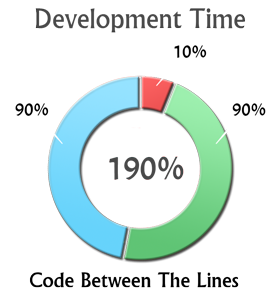 Some people prefer not to install unneeded programs or like creating things on their own. lucky for them, its not that hard to create a bootable USB drive. 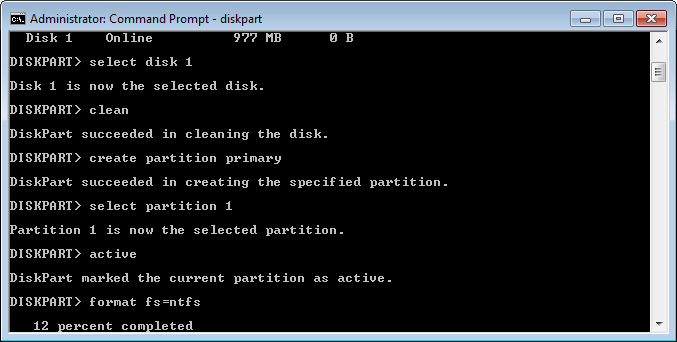 Start->All programs->Accessories->right click Command Prompt and select Run as administrator. Now run "diskpart" from the command line to open the Microsoft DiskPart application. 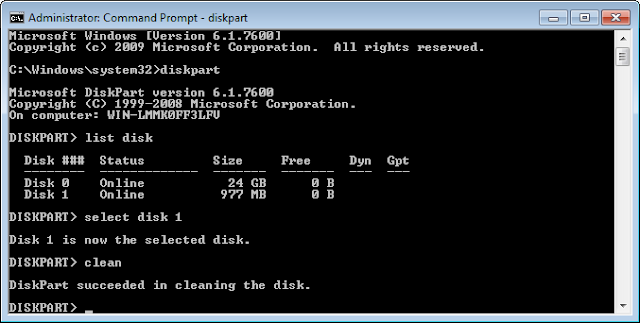 Next type "list disk" into the application like in the above screen to obtain information about each disk in the computer. 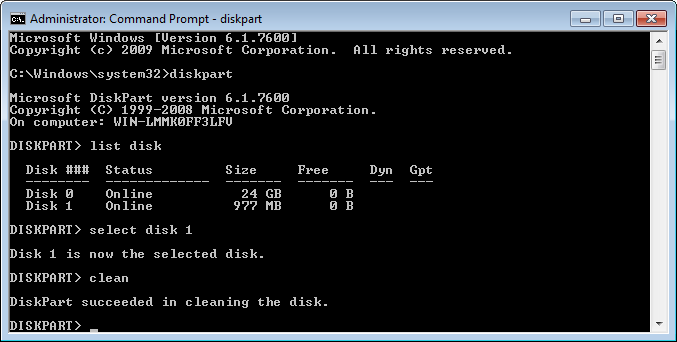 Note that for me Disk 1 was the Flash drive I inserted into the USB port. We need to select the flash drive by entering "Select disk 1" and then remove any existing partition or volume formatting from the drive by clean the flash drive with the "clean" command. Now we need to create a new partition on the drive we do this by entering "create partition primary"
Next we choose our new partition and activate it by entering "select partition 1" and then entering the "activate" command. Now we can format the drive with a NTFS file system using "format fs=ntfs"
You need to be patient since this might take a few minutes. 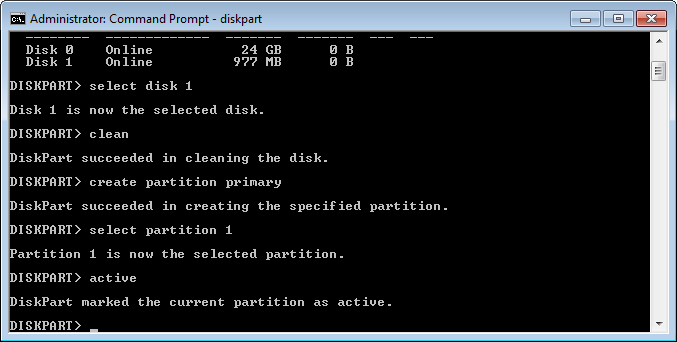 Once we're done formatting our drive we can assign it a letter so it will be reachable on our system with the "assign" command. At this point, were done with the DiskPart util and can close the util with the "exit" command. 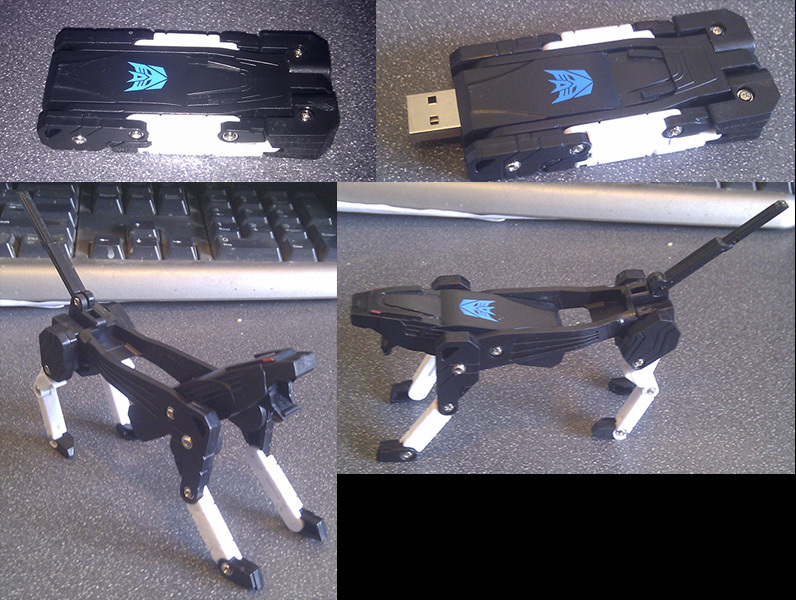 Basically were done with the USB drive itself and now need to add the Windows 8 portion. 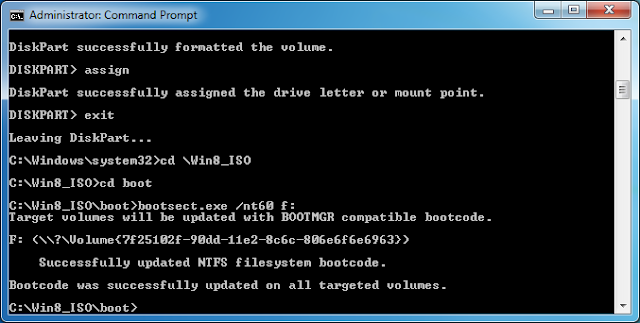 If you have Windows 8 on a CD, all you need to do is run "bootsect.exe /nt60 f:" from the boot directory in the CD, where f: of course stands for the USB drives assigned letter. Since I had Windows 8 as an ISO file I had to unpack the directory first. The final stage to get the USB drive ready is copy the contents of the CD to the USB drive or unpack the Windows 8 ISO file onto the Drive and restart your computer. Don't forget to set your BIOS to support Boot from USB.